Have you heard? The holidays are coming! It's time to crank up your creative spirit and show your loved ones what they really mean to you by making something for them with your very own hot little hands. You can do it. Really, you can. To help you through the creative process is Gather Here, a fabric, yarn, and fibers store offering classes in an inspirational work space with knowledgeable instructors. For almost two years their aim has been to provide a creative, fun, inspiring environment for the maker in everyone. The concept behind Gather Here is that if you have the space, equipment, and assistance, you can make anything. They provide a place to make something without having to purchase your own expensive equipment or make room in your home to craft. It's also a place where people can meet others who share a common interest (or two), and it's a gathering space to create, support, and learn from each other. 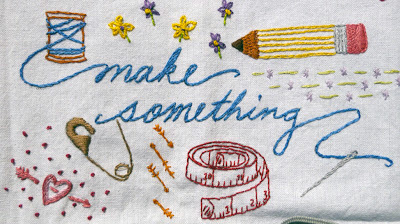 Gather Here offers classes in sewing (beginner to advanced), knitting (beginner to intermediate), crochet, hand embroidery, and also workshops that cover crafts like block printing, and repurposing all kinds of stuff. There's also a special book binding workshop THIS Saturday, December 1st, at 3pm with recently published and seasoned North Bennett Street instructor, Stacie Dolin, and if you have children looking for a quick sewing fix, they're offering a three-day Winter Sewing Camp from December 26th through the 28th. This class is a great gift for a young crafter interested in using a sewing machine, installing zippers, and wearing handmade pajama pants in 2013.